Beaverbrook Cottage has a unique history and a pleasing barn-like shape, with cathedral ceilings, alcove windows and a cozy yet elegant feel. It is decorated with antiques and original art, and the outdoor gazebo allows for al fresco dining, while the papasan chairs in the great room invite hours of reading or conversation. Lots of nature and privacy, yet close to town and culture. The cottage has a Wurlitzer piano and great acoustics, as well as games, yoga mats and art supplies. 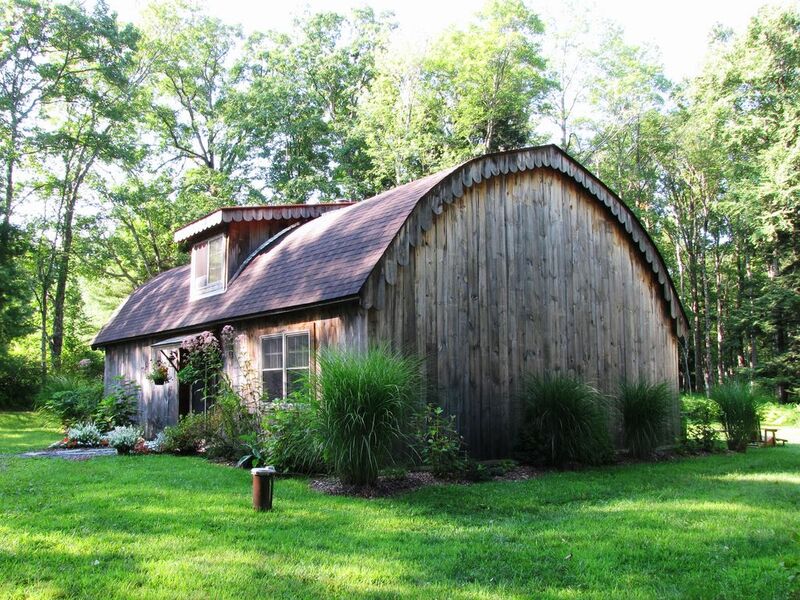 The cottage began life in the 1980s as a large two-story Quonset hut. A full renovation created an uncluttered, airy space with a unique design, featuring many original elements such as a wood stove, brownstone doors, and foundation pillars. The cottage is equipped with a washer/dryer, a full kitchen, linens, wifi, dvd player, a barbeque grill, a screened-in gazebo, and a fire circle. Enjoy great antique shops, country boutiques, excellent dining, family dining, farmers markets, hiking, boating and swimming, theater, art galleries and night life. I am a writer and teacher, mostly poetry and essays, and worked for the local weekly newspaper as an editor for 20 years. I grew up at the New Jersey shore and came to the Narrowsburg area in the late 1980s, where we raised a daughter. I was lucky that this property came up for sale in the early 2000s. It was perfect for my dream of renovating a space for family and guests to stay. I am happy when my guests feel renewed, refreshed and invigorated by the peace and beauty of the cottage. Lots of privacy, beautiful forest, bird and wild life viewing, acres of wild high bush blueberries to pick in season -- near the Delaware River and the fabulous hamlet of Narrowsburg -- also close to Bethel Woods Center for the Arts -- the cottage can morph into whatever you want it to be -- retreat, rest, family time, cultural high life, nature adventuring-- or all of the above. Thank you, Mary, for a lovely stay at your place. The cottage is spacious, airy, well-lit, and immaculate. Every detail is charming from the bathroom tiles to the wonderfully open living room. The screened-in gazebo in back of the house is a perfect place to sit and read, write, eat, or just enjoy the tranquil surroundings. Beaverbrook is a slice of heaven. The cottage is perfectly appointed, the setting is private, peaceful and beautiful. Mary is a consummate hostess and a lovely human. If i could give 6 stars here, I would. Natalie and her daughter Bee were as perfect as guests can be. Enjoyed the peace, watched the eclipse in the backyard and left the cottage in pristine condition. Wonderful people! Serene getaway tucked within Nature's beauty with all of the comforts of home. A most beautiful cottage with a lovely hostess. Mary made our escape so simple to enjoy, with special touches scattered throughout. Our visit to Beaverbrook Cottage was delightful in every way. We look forward to getting snowed in during the off-season! Many thanks to such a gracious hostess. Meg and her husband and friends were gracious, thoughtful and enthusiastic guests! Left the cottage in pristine shape. I hope to see them back again in the off season -- or anytime! We had a nice stay at Mary's cottage. It was clean and beautiful. Mary was responsive, friendly, and flexible. The property and stay was beautiful and we would definitely stay again! These guests were wonderful to host, game for the adventure of staying in the woods, respectful and clean. Would love to have them back anytime! Enchanting cottage in beautiful local! Perfectly stocked, beautiful home away from home! We spent almost four weeks in this amazing cottage. The owner, Mary, was a fabulous host, and the house and property were everything we could hope for - camp fires, BBQs, a screened gazebo for diners, and a short drive from countless river, lake, and woods adventures. Counldnt imagine a better stay! It was fabulous to have this family at the cottage for the month of July. They were wonderful guests! Enjoyed the grounds, and adventured in the area every day. It was great to see the children exploring nature, creating toys and games outside. I would welcome them back anytime.